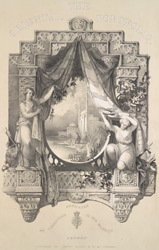 The design of this frontispiece shows 'Literature and the Arts' withdrawing a veil from 'Scenery, Architecture, Manners &c. of the Eastern World'. The landscape scene in the centre shows the bank of the Jumna River, within the modern city of Delhi, and was sketched from one of the windows of the Emperor’s Palace. The preface to the book states the reason for its publication: "In the belief then, that a comprehensive collection of drawings illustrative of the scenery and architecture of India is still a desideratum in this country, and that it will acceptable, not only to all who have an interest in India, but to all those who love to contemplate the delineation of natural beauty in all parts of the world, and to study the works of human art in conditions of society and under local circumstances of a diversified description, the Publishers have engaged in the present attempt to supply the deficiency ... The employment of lithography in the perfection to which it is now brought, will enable them, whilst giving full effect of the skill of the artist, to reduce the change so as to bring the work within the reach of general purchases."